There’s always some happening at the Mission! Below you’ll find listings of our events that are open for you to participate. We’d love you to come out and spend time with our staff and residents and become a part of our Mission family! God has placed a wonderful opportunity in front of the Rescue Mission of Middle Georgia. The board and staff have prayed, followed His lead, and we will be moving to our new home very soon! We have purchased the property at 6601 Zebulon Road, the former location of Hephzibah Children’s Home. God has given us 210 acres of land, which will provide a tranquil home for those in our program to recover. The land is absolutely beautiful and you can feel God’s presence there. This property is a place that provides safety and healing for those that want to join a community in recovery by way of Jesus Christ! It has been part of the Rescue Mission of Middle Georgia’s long term strategic plan to expand both the Men’s Life Recovery Program and the Women’s Domestic Violence Program as well as add a recovery program for women battling substance abuse and other life recovery issues. The layout of the buildings, in addition to the acreage, is the perfect answer to the Rescue Mission’s vision of looking to grow and create a larger healing environment through Christ. As you can see, GOD is moving and we are so excited! We know that God is using you to make this happen and we THANK YOU! We will have an Open House soon and you are invited! The date and time will be announced in the early spring and promoted through our Facebook page, website and newsletter. served at 11:30 a.m.on Thanksgiving Day! Volunteer drivers are needed to deliver a warm meal to our hungry neighbors – please contact Amy Walker – amy@rescuemissionga.com to sign-up! This event honors victims of domestic violence and their families, celebrates the successes of survivors and announces the community’s commitment to ending domestic violence. Join us at our Bargain Center and get a ribbon painted on your car to support Domestic Violence Awareness Month! Volunteers will paint purple ribbons on cars for donations on Tuesday, October 2 between 9:30 a.m. – 7:00 p.m. at the Rescue Mission Bargain Center, located at 3375 Napier Ave, Macon, GA. A special Bargain Center coupon for 10% off will be given to shoppers who make a donation of toilet paper, cleaning supplies, paper towels, baby wipes or diapers (size 4 or 5). Come by and support our efforts to raise awareness to Stand Up, Step Up, and Speak Up against domestic violence. The 2018 All General Motors Car show sponsored by the Corvettes Limited of Central Georgia and Five Star Automotive Group will be held on Saturday, September 15th. Registration begins at 8:00 am and closes at 11:00 am. The car show will be held at Five Star Chevrolet Cadillac Buick GMC dealership, 495 Watson Blvd., Warner Robins, GA. Entry fee is $25.00 if you register before September 8th or $30.00 after the 8th. Registration forms are available at CLOCG.com or at the Five Star dealership. Trophies awarded to top 15, Best of Show and Young Gun. Live music provided by the well-known Tres Hombres Band. Please come out to support the Rescue Mission of Middle Georgia. Donations of paper towels, toilet paper, toiletries and canned goods will be accepted for the Mission please bring these items with you to the car show. For more information contact Amy Walker, Development Manager – Rescue Mission of Middle Georgia 478-743-5445 ext 403 or Richard Alexander – Corvettes Limited of Central Georgia 478-396-9410. Come shop at Macy’s and customers can round their purchase up to the nearest dollar and donate the difference to the Rescue Mission of Middle Georgia. Please join us in honoring new GRADUATES of our program. and found a new path thanks to Jesus Christ. Witness their success first hand and hear their stories. Your shopping matters. 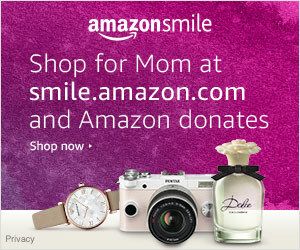 This Mother’s Day, shop for Mom at smile.amazon.com/ch/58-6011446 and Amazon donates to Rescue Mission of Middle Georgia. These residents have completed our long term recovery program and found a new path thanks to Jesus Christ. The Rescue Mission’s Annual Christmas Meal will be served on December 22nd beginning at 11:30 a.m. Join us as we celebrate the most precious gift of all, Jesus Christ! The Rescue Mission of Middle Georgia’s annual Thanksgiving meal is not only a way of feeding those who are hungry, but also to show kindness, support and the love of Christ to those that suffer with some type of poverty and misfortune. Our Thanksgiving meal will be served in house at 11:30 a.m. on Thanksgiving Day. We are planning on serving more than 1,200 people in this year’s Thanksgiving event. During this time, the Gospel of Jesus Christ is shared with many that will receive a meal from the Mission. Last year, we had the pleasure of seeing many come to Christ! It doesn’t get any better than that! Join us as we take a stand against domestic violence and honor those that have suffered at the hands of another! October is National Domestic Violence Awareness Month and we have planned the following activities! Please mark your calendar and come support our efforts to raise awareness! • 186 purple pinwheels will be placed out front of our building every weekday for the entire month. These pinwheels represent the number of victims each day in the state of Georgia. At the end of the month we will have placed over 4,000 pinwheels. We need volunteers to help place these each day. Contact Amy Walker at amy@rescuemissionga.com to sign-up for a time slot. • 31 days of social of social media posts to support awareness in our community. These will include pictures of events and daily stats. Go to our Facebook page and share our posts! • Purple baskets with information about our services and the local services offered to women and children experiencing abuse will be placed at local grocery stores, businesses, gyms and boutiques. If you are interested in placing a basket at your business please contact Emily Smallwood at emily@rescuemissionga.com. • Information tables will be set-up at local churches during their Wednesday night supper /bible study. We would love the opportunity to come speak to your group. Please contact Linda Wessells at linda@rescuemissionga.com to schedule. • The Grand Finale will be held on October 30th from 6:30-7:30. We will have a special guest speaker and will hold a candlelight vigil to honor those that have suffered from abuse.